It's October 1! NOT ONLY are the Cybils nominations now officially open, but it's time for your AudioSynced Roundup! 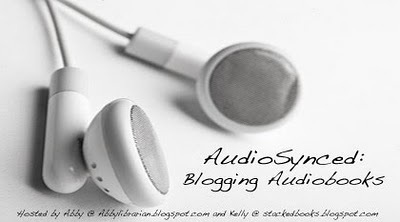 AudioSynced is a monthly roundup of audiobook reviews and news from around the blogosphere. If you've got a link I missed, please add it in comments and I'll include it with the roundup. And if you're looking for more great audiobook reviews, always remember to check out Audiobook Jukebox, an extensive database of audiobook reviews! Amanda at YALSA's The Hub posts about the Amazing Audiobook Nominees and reminds us to nominate our favorite recent YA audiobooks for the list! The voters have spoken and the winner of the Book Blogger Appreciation Week Best Audiobook Blog is Devourer of Books. The Looking Glass Wars by Frank Beddor, read by Gerard Doyle, reviewed by Allison at Lost in the Pages. Allison says, "I think this might be a case where the audiobook version of the story could actually be better than the printed version. At times Beddor’s writing feels a little superfluous or stilted, but Doyle read it in a way that made it all feel quite natural and perfect for the story..."
The Misfits by James Howe, read by a full cast, reviewed by Lee at Reading With My Ears. Lee says, "[Spencer] Murphy does the major narrator duties, and he creates a completely believable character of a sad, shy boy. The other young readers also sound comfortable and natural in their performances." The Penderwicks at Point Mouette by Jeanne Birdsall, read by Susan Denaker, reviewed by Lee at Reading With My Ears. Lee says, "Denaker portrays a large cast of characters with interest and appropriateness... It's a lovely performance." The Wednesday Wars by Gary D. Schmidt, read by Joel Johnstone, reviewed by April at Good Books & Good Wine. April says, "I absolutely recommend reading Gary D. Schmidt’s book via audio. The narrator, Joel Johnstone, has a pitch perfect voice, reminding me of The Wonder Years or the Sandlot narrator." Delirium by Lauren Oliver, read by Sarah Drew, reviewed by April at Good Books & Good Wine. April says, "Sarah Drew does a fantastic job handling the character of Lena... [Her voice] really carried the story and sounded exactly how I would imagine a teenage girl. She’s rather convincing." Fat Vampire by Adam Rex, read by Kirby Heybourne, reviewed by Lee at Reading With My Ears. Lee says, "[Kirby Heybourne's] relatively high voice, the sing-song quality of his reading, and the precise diction simply aren't very interesting to listen to. Occasionally, he breaks out of these patterns, and is really, really funny!" Heist Society by Ally Carter, read by Angela Dawe, reviewed by April at Good Books & Good Wine. April says, "[Angela Dawe]... has a bit of 1940s sophisticated twang which is exactly how I would imagine a globetrotter to sound." Hold Me Closer, Necromancer by Lish McBride, read by Jonathan Todd Ross and Chris Sorensen, reviewed by Susan at Librarian Pirate. Susan says, "The audiobook narration is good. There are two male narrators, though, for the two main POVs of the book, but I didn't even realize that until haflway through because the voices were so similar." Juliet Immortal by Stacy Jay, read by Justine Eyre, reviewed by Michelle at Never Gonna Grow Up. Michelle says, "The narrator for this audiobook is a great actress, but her voice sounds really old. Like, I thought she could be Juliet’s grandmother." The Knife of Never Letting Go by Patrick Ness, read by Nick Podehl, reviewed by Beth of A Foodie Bibliophile in Wanderlust. Beth says, "I did not buy Nick Podehl's performance of Todd in the slightest. What Nick sounded like to me was a refined, college educated man trying way too hard to sound like a young, illiterate 13-year-old boy and yet it was also half-hearted at the same time." The Marbury Lens by Andrew Smith, read by Mark Boyett, reviewed by Lee at Reading With My Ears. Lee says, "Mark Boyett reads the novel, and he is very good... His voice is a bit gravelly for a teenager, but Boyett overcomes this by speaking in those boy rhythms as Jack and Conner exchange insults as conversation." The Running Dream by Wendelin Van Draanen, read by Laura Flanagan, reviewed by Lee at Reading With My Ears. Lee says, "Flanagan gets the teenage voices really well, and is particularly effective with the inflections and characterization of first-person narrator Jessica. She portrays Rosa's speech impediment (which Jessica describes as "under water") honestly, while ensuring that we can understand her." Sabriel/Lirael/Abhorsen by Garth Nix, read by Tim Curry, reviews by Susan at Librarian Pirate. Susan says, "Tim Curry needs to quit all his other jobs (and I love all his other jobs) and just read books to me." The Spectacular Now by Tim Tharp, read by Macleod Andrews, reviewed by Abby at Abby the Librarian (that's me!). I said, "Andrews simply becomes Sutter Keely and that lets the listener really sink into the audiobook and become immersed in the story. This audiobook had me looking forward to my commute and road trips so I could continue the story." Story of a Girl written and read by Sara Zarr, reviewed by Abby at Abby the Librarian (that's me!). I said, "Sara Zarr doesn't voice characters, the reading's not flashy, but Sara Zarr, narrator, gets out of the way and lets Deanna's words speak for themselves." Streams of Babel by Carol Plum-Ucci, read by a full cast (kinda), reviewed by Jeanne at Books for Ears. Jeanne says, "With six readers, I do list this as a ‘Full Cast Audio’ book – but it isn’t really. Each voice is tied to a single character and tells their part of the story. It is a good set of voices – though I did like some better than others." The Summer I Learned to Fly by Dana Reinhardt, read by Sharon McManus, reviewed by Lee at Reading With My Ears. Lee says, " There was real emotion in [Sharon McManus's] reading, I heard the lump in her throat when Drew reads a section of her father's notebooks. I'd listen to her read again." Thirteen Reasons Why by Jay Asher, read by Joel Johnstone and Debra Wiseman, reviews by Abby at Abby the Librarian (that's me!). I said, "Both [narrators] read clearly and with the requisite emotion for these intense roles. I probably wouldn't have read the whole book if I had been reading instead of listening." Always Something There to Remind Me by Beth Harbison, read by Orlagh Cassidy, reviewed by Jessica at Cover to Cover. Jessica says, "ALWAYS SOMETHING THERE TO REMIND ME worked extremely well as an audiobook, especially since the book flashed back between past and present. This give the narrator Orlagh Cassidy a chance to use many different voices and tones." Cryoburn by LoisMcMaster Bujold, read by Grover Gardner, reviewed by Jeanne of Books for Ears. Jeanne says, "I really enjoyed this book, but I probably wouldn’t recommend it to someone who has never read any of the rest of the Vorkosigan Saga." The Girl with Glass Feet by Ali Shaw, read by Heather O'Neill, reviewed by Lanea at Books for Ears. Lanea says, "Heather O’Neill is a fantastic reader, and I think her tone and pacing were just right for this book." A Heartbreaking Work of Staggering Genius by Dave Eggers, read by Dion Graham, reviewed by Lee at Reading With My Ears. Lee says, "Thank goodness for Dion Graham, whose really stellar performance makes this go down pretty easily." Insatiable by Meg Cabot, read by Emily Bauer, reviewed by Susan at Librarian Pirate. Susan says, "Insatiable is quintisential Meg Cabot. Fun, quirky, deceptively light (she always packs quite a bit of substance into her fluffy reads, if that makes any sense), and fantastic." Voluntary Madness by Norah Vincent, read by Tavia Gilbert, reviewed by Carin at Caroline Bookbinder. Carin says, "Initially I wasn't crazy about the narrator. I'm not sure why but her voice didn't match up to what I was expecting or it wasn't fitting with the emotions or something, but by the time I was halfway in, that wasn't a problem at all anymore." If you've got a link from September that I missed, please leave a link in the comments and I'll include it! Didn't review an audiobook this month? No worries - AudioSynced will be back on November 1 at STACKED.